The next personality type in our ongoing discussion of Myers-Briggs personality types in the workplace is spontaneous, outgoing, and resourceful ESFP. ESFP personalities are often referred to as “The Entertainer,” with about four to ten percent of individuals obtaining this personality type. Let’s take a deeper dive into what this type looks like and how they work. 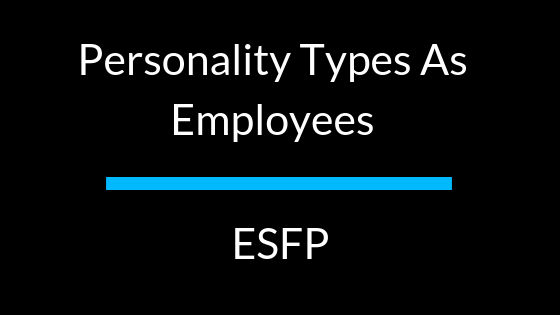 ESFP stands for Extraverted, Sensing, Feeling, Perceiving. These individuals thrive on interaction with others and spending time socializing. They don’t often think about the distant future, but instead focus on living in the moment and like to keep their options open. ESFP’s prefer to learn about concrete facts versus theoretical ideas, yet they make decisions based on personal feelings rather than facts and logic. Whatever position ESFP’s find themselves in at work, they strive to make the environment as enjoyable and friendly as possible. They have a knack for using their relaxed yet social attitude to get everyone on board with completing tasks that need to get done. If Entertainers know what the goal is and they have the freedom to meet the needs, they are one of the best personality types to have in a hectic and dynamic workplace. Entertainers are not the type to enjoy being stuck in mundane, repetitive, strictly defined tasks. They much prefer to form new ideas, try new thing, and put those new ideas to work. They thrive on change; however, they can be forgetful in the heat of the moment, and it may take a few tries for changes to stick entirely. While Entertainers are quick to give open and honest feedback, they are sensitive to others criticism of their habits and can become defensive and easily upset when under fire. That being said, if they believe that the criticism received is genuinely meant to help and not hurt them, they will take the feedback to heart. The most significant struggle when it comes to managing ESFP personality types is their need for creative freedom and independence. Since they value these much more than security and safety, they will not make do with their conditions if they aren’t met, but will instead leave.